Share the post "5 Ways To Reduce Stress Simply By Raiding Your Kitchen Pantry"
It’s something of a cruel vicious circle: you’re stressed out so you go and raid the pantry for comfort foods like chocolate, ice cream and bags of chips. But the truth is that these so-called comfort foods actually promote health problems like diabetes, obesity and oxidative damage. The short-term gain of reducing your stress levels by eating these foods might actually be part of the stress problem! Green vegetables: Eating vegetables rich in folate, like spinach, is a proven way of promoting the production of mood altering substances like Serotonin. Asparagus, for example, is a great source of folate and can be steamed and used in salads, or as a side serving with fish. Avocado: This humble green fruit is a well-documented superfood! Avocados contain a huge number of nutrients, including Vitamins E and B, Potassium, Glutathione, Folate and other vital substances. It has been shown to be quite filling, and so eating just one half might be a good way to reduce your hunger and control your weight. Spread it on a sandwich or on rice crackers for a healthy way to beat the cravings. Cashew and Pistachio nuts: Technically, this is a two for one entry, but since they’re both nuts, I’ll class them as one food! Cashews are particularly important for providing our bodies with Zinc. The problem is that our bodies can’t actually store any Zinc, so we need to feed some of it to our bodies each day. Zinc is linked to reducing depression and stress. Pistachio nuts help our blood vessels to relax when we’re stressed so that our heart doesn’t have to do as much work. It’s important to note though that eating organic Pistachios or those that are not mouldy or damaged is important. 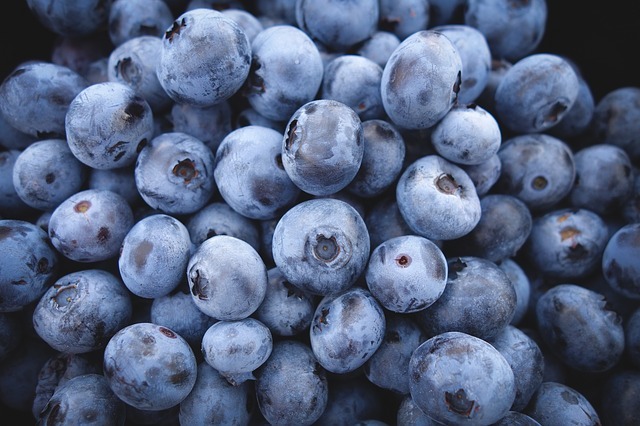 Blueberries: Lots of berries are good for you, but Blueberries in particular promote our brains to produce Dopamine, which is an important mood regulator. Not only do they help our brains, but they also aid our immune systems by increasing the numbers of certain white blood cells. Dark Chocolate: Now, what better way to end this products list than with a food that many people simply love? Believe it or not, dark chocolate is rich in anti-oxidants and when eaten in moderation it can be beneficial in fighting the symptoms of depression and anxiety. Eating dark chocolate promotes production of a brain chemical called Anandamide. This chemical is useful in blocking the feelings of depression temporarily. Eaten in moderation regularly, along with the other superfoods in this list, it can reduce stress, anxiety and depression and promote a sense of well-being and calm. Whilst feeling stressed might seem like a vicious cycle of mood swings and poor diet, you can help yourself to fight it by indulging in more of the foods that promote health than those that increase your stress levels. You’ll be surprised at just how many foods in your pantry can help you to feel good and beat the stress!